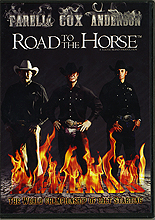 Never before have the three greatest horsemanship educators of our time stepped into the dirt to prove their techniques at the same time. Featuring contenders Chris Cox, Pat Parelli and Clinton Anderson. What will happen? Capture your round-pen side seat for the action with this special 3 disc DVD set which will ship sometime in early June.